Heating, Ventilation and Air Conditioning systems are commonly known by the abbreviation HVAC systems. As the name suggests, HVAC systems are used for maintaining indoor temperature in residential, commercial or industrial buildings and to maintain a certain level of air quality indoors. Ventilation - uses fans or natural convection to maintain air flow in the building for temperature control, air quality control, filtering etc. Air Conditioning - uses a refrigerant which is first compressed and then throttled to cool down the indoor air and then circulate the cold air to lower indoor temperature. A heat generator - this can be a furnace / boiler using any fuel to heat up the 'heat distribution medium'. For example, a boiler (generator) is used to boil water and produce steam (heat distribution medium). This steam is then circulated through steam pipes (distribution network) to each room in a building. In each room the steam will be circulated through a radiator to warm up the room. When the steam is cooled down, the condensed water flows back to the boiler room. Here it is again fed to the boiler to produce steam and send it back to the rooms. Ventilation systems are installed to keep the air moving in a building. Circulated air is put through the heating or air-conditioning system as per requirement for maintaining indoor temperature. Ventilation systems are used for recirculating the indoor air as well as for replacing some of the indoor air by fresh air from outside. A ventilation system is also used for maintaining acceptable indoor air quality by filtering out dust, bacteria and other particulate matter. 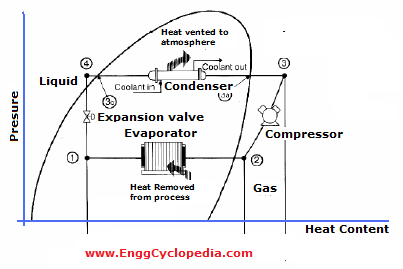 A refrigeration system uses a refrigerant fluid which is first compressed and then throttled across an expansion valve to cool it down as per Joule Thomson effect. The cold refrigerant is then used for cooling down the indoor air. Cooling towers circulate warm air through a column of small water streams percolating through a tower. Passing air helps in evaporating some of this water, cooling it down. In turn the contact of this cold water helps to cool down the passing air.